Sorry to hear about your fish deaths! Just for the sake of being very clear, when you say your water tests were optimal? What were the values exactly? That's lots of fish in a tank. Do you have a long term plan for then all? What is the regular water change schedule. 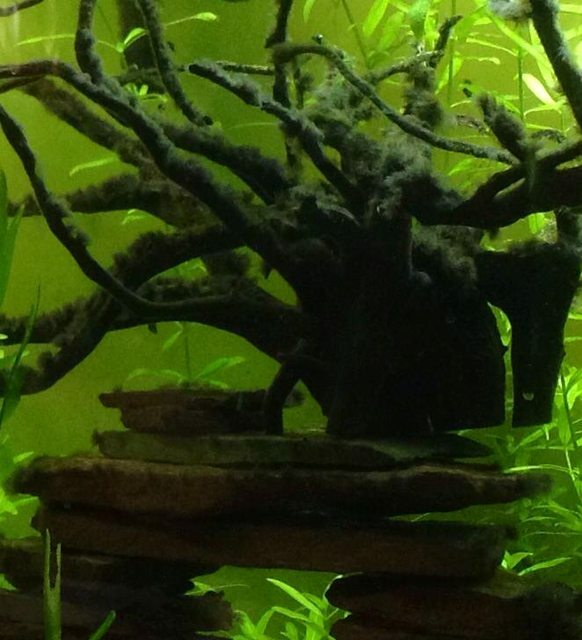 What I see on your driftwood looks like some beginnings of black beard algae. Not abnormal for most aquariums in small quantities but one needs to be careful it doesn't get out of control. What is your lighting schedule? I do at least a 5-10g water change each week to vacuum the bottom of the tank. Every 2nd or 3rd time I do about 40% water change. In regards to lighting, I have a homemade canopy that can be suspended from the ceiling with chains. This allows me to keep the area lit while I work safely. When I work, I keep it about 2-3 feet above the tank. I usually leave it about a foot above the tank when I am done, but since I noticed the problem, I am keeping it directly on top so it only has the 3 inch gap running along the back. I thought the soot from my chimney may have got in there somehow due to the suction my air conditioner causes (seems like I can smell it in the air sometimes). As for the lighting schedule, I usually have them on for about 6 hours a day. Keep in mind that since the canopy is usually suspended, it is not as bright as it would be if it was directly on the tank. There is never direct sunlight on the tank. This is a project I am doing with my son. The eventual goal is to sell the guppies (more for a life lesson than for profit), so I want to make sure they stay healthy. p.s. the reason why I ruled out the soot is because I took a plastic spoon and scraped the wood, but the dots did not fall off as expected. Please correct me if I am wrong. It could be the start of black beard, or another algae I get here sometimes that just stays as black (actually very dark red) dots like that. I have one tank where I have to use a razor blade to get it off the glass, and have had to for years. It's one of those weird things we get in tanks. If it's black beard, it's more of annoyance than the 'black whisker' version it resembles in your photo. Let's hope it stays as stubble and doesn't go full hipster on you. It sounds like a good water change routine, though I would never do less than 25%. You are overstocked, and will have occasional losses even with good water changes, if you overfeed, etc. You are tightrope walking with 100 fish in a 40. 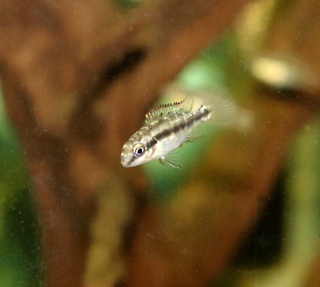 Short finned guppies would be fine, but fancies are much more delicate. Guppies will overpopulate and crash - they are descended from wild fish that face enormous predation and have no shut off valve. Some species seem to balance out their numbers, but guppies breed in a race with predators that aren't there in captivity. Thanks for the info Gary. Just to be clear though, there are only about a dozen adults left. The rest range from newborns to ones that are about 1/3 the size of the adults (with the majority being closer to the smaller side). I keep a very close eye on water conditions, but I agree that eventually the tank will be overcrowded if we don't find them new homes. 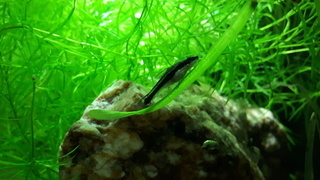 As for the algae, is it poisonous? The fish spend lots of time nibbling at the driftwood. In the wild, guppies eat algae and the micro-organisms that live with algae. Your tank is turning natural. Nice relief to hear this. Hoping that it's not anything else. We have Blackbeard in our 220g....and it is slightly out of control (our fault!). 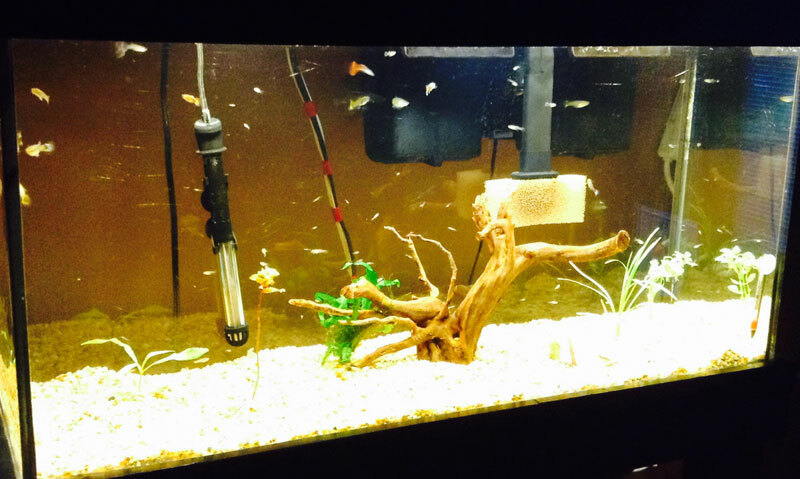 The fish don't mind (in fact, the barbs often pick at it, and the loaches lay in it! ), but it is a bit of an eye sore for humans! It started out similar to what your pic shows, black dots on the driftwood. Now, well, it lives up to the name of Blackbeard - a bunch of fuzzy black bits clumped together! Eventually, our plan is to take the wood out, scrape it, and let it sit in the sun....I doubt we will ever fully get rid of it though at this point! I have to admit, it really doesn't bother me too much, although people often ask what it is when they look at the tank! So, it must look much worse than I think....I have 'habituated' to a certain degree, I suppose! Not sure if you can see it well in this pic, but this is a pic of our spiral wood....it has been hit hard with the stuff as it has had lots of time to 'fester'! This is the piece we need to take out, scrape, and sit in the sun....prepare yourself for this pic! A lot of planted tank people want absolute control over the aquarium environment, a reasonable wish. I strive for balance, see algae as a sign of life in the tank, and as a potential food source for many species. It can also be an eyesore if it gets loose, but in a sensibly run aquarium, it rarely gets really wild. Generally I'm with Gary on this one: as long as the plants do ok, the algae tends to be in or at least under control. The only addition would be that I added a Siamese algae eater in my upstairs living room display tank. It keeps everything under control, and the Fishroom gets the out of sight' out of mind approach. Thanks for the info guys, but for some reason, my fish are turning white and a couple are dead each morning. I re-checked all my levels and they are all still good. I did a 50-60% water change 2 days ago in hopes that it would help, but I have no idea what is causing this. I read lots of info via google searches and unfortunately it seems to be fairly common..however no one has found the cause. Turning white where? How does it progress? Is it on the scales, or internal? Does it start at the base of the tail? It had nothing to do with the algae. That was a red herring. their whole bodies seem to be turning white. The scales seem fine. 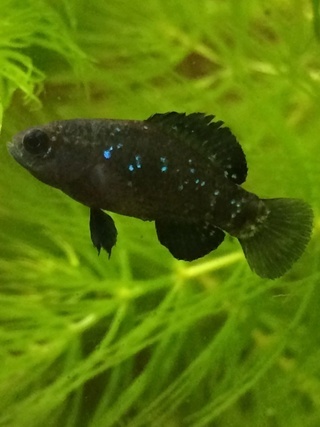 Even one of my fancy males died and he did not seem to be turning white. I am not sure where it starts from since 90% of the population are babies and I only noticed once they were white already. ** Additional info.. I have a marineland 400 filter. 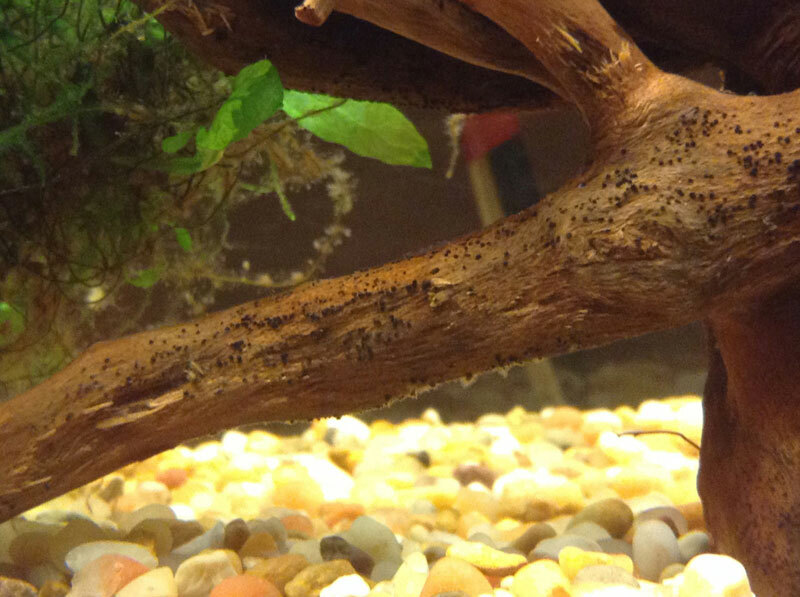 The water re-entering the aquarium seems to have tiny particles in it. I presumed it was due to the bacteria the wheels cause. So sad to hear that you and your fish are going through this. I am no expert, but with certain species, through my experience, when the entire body becomes pale, it can often mean disease/parasites/water issues/etc.. That is their way of showing you that there is a problem. As for the odd shape of the female, maybe a result of inbreeding? Or maybe a disease...I do hope someone chimes in with more helpful input on that one. You mentioned tiny particles coming from the filter, can you provide more details on that? I have seen a foam form from the filter due to lack of flow, but curious about the particles you mentioned. As I mentioned before, most incidents of algae are just an eye sore for humans, fish don't care, and many actually enjoy having it around! Keep us updated, for sure. It can be frustrating not knowing how to fix an unknown problem. Hopefully we, as a community, can help to figure this one out. If the base of the tail goes pale first (the 'caudal peduncle'), it is a barely treatable problem (usually a Columnaris type bacteria). I can't treat it here, as aquarium antibiotics are banned, but in many jurisdictions, they are easy to get. A whitish film will be skin parasites. is there anything else i can check for in terms of doing water tests? I added a bubbler for more aeration, but how can i tell if they have enough? Most of the time my canopy is off, when I cook, can the smell or other airborne elements enter the tank and cause disruption? I wish I could provide you guys with some scientific facts to help solve this, but I feel like I am just taking shots in the dark here. Do I just sit and wait? Thanks for your input guys. It's nice to know there is a friendly community around to share the joys/pains and knowledge of this hobby. Can you describe the white colouring - is it embedded, protruding, cottony, etc.? As Gary mentioned, where did it start, or if that was missed (which can happen) where is it most visible on their bodies now? As for water tests, we generally test for ammonia, nitrites, and nitrates. We are in a well, so I have since learned we have more lurking....but those are the top three in my mind to test for when things seem amiss or when starting a new tank. I think you are looking in the wrong places. I suspect, based on experience, that your problem is inside the fish. The cheaper fishfarms raise a lot of fish, guppies included, in antibiotic soups. They grow faster and die less - great if you want to move them to market. The problem comes with the removal of the antibiotics. The fish have none of the basic acquired immunity they need, and they tend to wipe out from bacterial complaints that a healthier specimen would shake off. 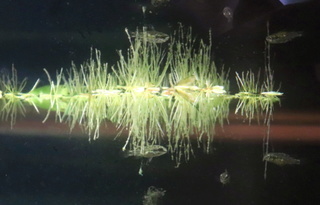 At times, store livebearers especially are little time bombs. Guppies are a problem right now. It can take weeks for something to hit them, but when it does, it can spread through the tank steadily. We had a guy in our local club who fell in love with guppies and went through a sequence like you are describing twice before he quit the hobby in disgust.It was a shame, because prior to his sick guppy experience, he was having fun. One of my local stores was getting customer complaints about their guppies. They actually ordered them from several far eastern suppliers and didn't sell them for 3 weeks. In crowded store conditions, it hit fast. They felt it was viral, and the bacterial infections came when the fish weakened. They lost three full lots. The fourth farm they ordered from sent clean guppies, and they are now selling them again. They told me they had no way of predicting without testing - the fish always looked great upon arrival. Yes, you had them two months, but pale bodies are usually bacterial infections and they may well be timebombs going off. That's not encouraging, but if you stay the course, the survivors will have normal immunity. Or, I could be completely and totally wrong. I only got 2 from a pet shop. The rest came from a local hobbyist. Everyone was doing fine. The females were giving birth, the newborns were growing and getting colors. This weird algae started to grow (awful coincidence) some fish started to die, then suddenly like a zombie apocalypse, everyone is getting sick. Unfortunately I am already preparing for the worse case. How would I "reset" my tank before introducing new fish? Did the two from the shop come last? when I cook, can the smell or other airborne elements enter the tank and cause disruption? I doubt the smell would do anything, how close are the stove and the tank? I mean, if all the variables were to line up right, and you were using some airborne toxic cleaners... I might be more concerned. For example, when I cook burgers, even the floor outside the kitchen feels slippery. The neighbors can probably smell the food. I thought the water may absorb some of that essence. Was just curious, but does not seem like it's the case. You can get a greasy film on the water if you have a tank in a kitchen. It's an organic, and not a good one, but it isn't going to cause disease. Airborne cleansers or poisons will kill, although I once had a landlord spray an apartment with insecticide (the guy upstairs had roaches) after illegally entering, with no notice, and only the surface fish died. Standard cooking would have no effect. Our tetra tank is about 20 feet (maybe less) from the stove in our kitchen (open concept kitchen and livingroom). We have never had any issues there, and we cook lots of 'smelly' foods (okay, bad choice of word, but we cook lots of spicy foods with various 'aromas'!). I agree with Gary with regard to chemicals commonly used in a kitchen being more of a threat, especially sprays (e.g. Glass or counter cleaners, air fresheners, etc.). I tend to use wipes as much as I can. If a spray is absolutely needed, I always cover the tank. Hmmmm....The floor gets slippery after cooking burgers? Those must be some good old fashioned greasy burgers! Tee hee - just teasing! I do hope things turn around with your tank....keep us updated.